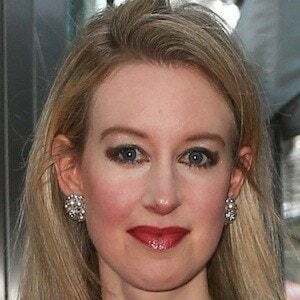 Entrepreneur and CEO known for being the founder of the blood-testing company Theranos. The company came under scrutiny in 2015 after the validity of their tests came into question, leading the Centers for Medicare and Medicaid Services to call for banning her from the industry for two years. She attended Stanford University, where she studied chemical engineering but didn't graduate. Inspired by her fear of needles, she founded Theranos with the goal of providing minimally-invasive blood-tests. She's credited with having more than 80 patents and her company has previously been valued at nearly $10 billion. She's related to one of the founders of Fleischmann's Yeast. She was born to Christian Holmes IV and Noel Daoust and has a brother named Christian Holmes V.
She was named America's top Self-Made Woman by Forbes in 2015, four spots ahead of Oprah Winfrey.